This roughly 654 kilometer trip parallels the Middle Age’s “Golden Road” known as a trading route connecting Paris to Prague. Explore the city of Nuremberg and other South German cities including Palatinate and Franconia. The route is primarily on asphalt with minimal inclines but be prepared to encounter brick streets, gravel roads, and sand. 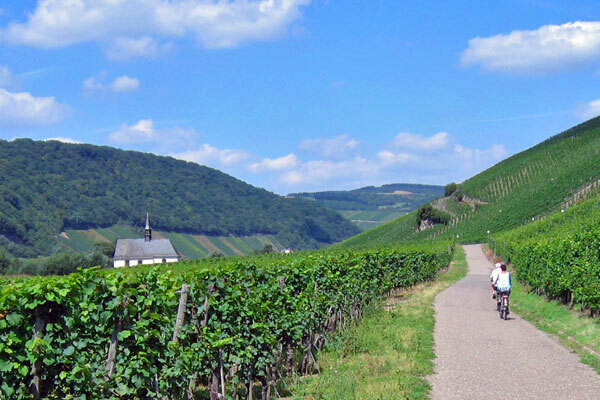 Being the flattest on the list, the Römer-Lippe route is the most children-friendly course. It follows along the Lippe River recognized as the longest river in the North Rhine-Westphalia and passes the source of the river, “Odin’s Eye”. The course is filled with Roman history as it begins at Detmold, which was where Hermann battled and won against Roman armies. The path will also lead you to museums and ancient sites of Roman camps. The Danube route comes in at a little over 608 kilometers. Following the river, scenery includes the Black Forest, Bavarian Forest, Swabian Alb, and the Donaurjed basin. You’ll pass through Ulm, known for having the largest church tower in the world. The trail starts in Donaueschingen and ends in Passau, and you should note that signposting is not standard in this area. A little under 161 km, the Berlin Wall Trail is the shortest route and maybe the fastest way to tour Berlin if you’re hard on time. Ride around the center of center, museums, and the last residual watchtowers. Once out of the city, the tour becomes more scenic and a bit quieter. It’s the best opportunity for some city riding and rural riding. At the Bay of Lübeck, you’ll pass by many resorts including the Heiligendamm while riding along the Baltic coast. The terrain consists of asphalt, sand, and gravel paths along the flat coastal region with the occasional steep hill. This course starts at Flensburg and end at Ahlbeck (Usedom) with a pleasant stretch around the Fischland-Darss-Zingst peninsula. Info courtesy of germany.travel , and life experience.